For the longest time, granite countertops were what every homeowner dreamed of having in their kitchen. However, over the past few years, quartz countertops have become more in demand. In fact, according to Google Trends, quartz countertops have almost doubled in popularity amongst people here in the United States since 2014. This is not to say granite isn’t popular anymore, far from it, but more homeowners today seem to be leaning towards buying quartz countertops. 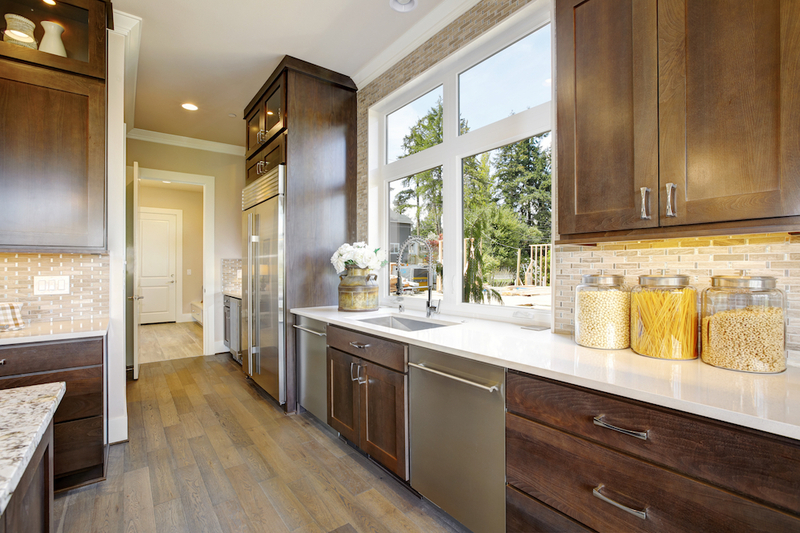 So, why have quartz countertops become so popular recently? Before we start, it’s best to have a good understanding of what quartz technically is. Quartz is not a natural stone like granite or even marble. Granite and marble are solid all the way through. Quartz on the other hand is an engineered product made by compressing thousands of tiny pebbles together with a resin of some sort. Specific pigments are also added to give the stone it’s gorgeous color. Some manufactures even add glass or metal flakes for a really unique, sparkly look. Before you make up your mind on a specific color, make sure you’re choosing a shade that’ll go well with the rest of your kitchen or bathroom. If you’re remodeling a kitchen from scratch, be sure to do your research and plan, plan plan! Don’t rush the process. If you’re just not sure, hiring an interior designer may be well worth the money. Granite countertops need to be sealed regularly. This protects the countertop and keeps it in good condition. Having to seal your countertops takes both time and money. When you invest in a quartz countertop, you won’t have to worry about that. Quartz is a non-porous material. This means that it doesn’t need to be sealed. In addition to this, because quartz is a non-porous material, it’s easy to clean and maintain. If you’re interested in a low-maintenance countertop, quartz is your best choice. Quartz is a very durable material with a long life. It’s scratch resistant, stain resistant, and extremely hard to chip or crack. You’ll never have to worry about accidentally spilling a glass of red wine on the surface or using harmful cleaning agents. Quartz is one tough material. The only area where granite beats quartz is when it comes to heat resistance. Granite wins the race here. Quartz can be severely damaged if a hot pan or dish is laid directly on the surface. To prevent unnecessary damage, always make sure you use a hot pad. It’s a small sacrifice to keep your quartz countertops in great condition. Unlike granite, quartz has a uniform shape that homeowners absolutely love. This uniform shape is beneficial for a few different reasons. First, it’s easy to choose your quartz countertops based off a little sample. You can even choose your quartz countertops from a picture in an ad. With granite, it’s not that simple. Each slab of is different in its own way, and what you see in an ad might not look the same when it’s in front of you. As a result, you’ll really want to examine your granite up close and in person before you purchase it. This can be extremely time consuming. Another benefit of having a uniform shape is the way the seals fit tightly and are hidden. The uniform shape allows two slabs of quartz to be fused together with no noticeable flaws. This isn’t always the case with granite countertops. The edges of granite tend to be rough and are much harder to hide the seams. Although quartz weighs just about as much as granite, it’s actually much more flexible. What does this mean for you? Because of the flexibility, quartz is less likely to break or become damaged when you’re installing it into your home. Accidents happen, and when one does, you can feel great knowing your quartz countertops will stay in good condition. The flexibility of quartz also makes cutting and shaping your slabs a much easier jobs as well. This is great news for people who want specialized designs. Like mentioned earlier, quartz has a non-porous surface. As a result, bacteria and other germs don’t stick to quartz like they do with granite. This in return means that your surfaces will not only be easier to clean but also healthier for your whole family too. You’ll really appreciate this come flu season. Quartz is an excellent choice for large or busy households. It takes a lot more energy to cut granite from a bed of rock and transport to dealers and warehouses across the country than it does to make a slab of quartz. This is especially true if you purchase high-end granite from another part of the world. To add to this idea, people interested in quartz can also be even more environmentally friendly by purchasing their countertops from local fabricators. This reduces the energy required to transport the quartz countertops long distances. When it comes down to it, quartz is a little bit more expensive than granite. In fact, the average price for a square foot of granite is anywhere between $80 to $140. The average price for a square foot of quartz is between $80 to $175. Although the price difference is significant, homes with quartz countertops tend to sell more than ones with granite countertops. If you should ever decide to sell your property, you’ll more than likely get more than you originally invested into it. Another thing that you’ll want to consider is all the maintenance fees you’ll eliminate by choosing quartz. It’s recommended that granite countertops be sealed annually. By not having to do this, you’ll save yourself a lot of money over the years. In addition to this, quartz is also much harder to damage than granite. This means less money will go to unnecessary repairs. Although granite is still quite popular these days, there has been more of a demand for quartz over the past few years. Homeowners love the fact that quartz is low-maintenance, highly durable, available in a wide array of colors, and extremely beautiful. Quartz is by far the better investment for your average household. Once you invest in quartz, you’ll understand why this material get more popular every year. If you are considering quartz countertops for your kitchen or bathroom, let us know, we’re here to help.